MURFREESBORO -- The most recent statewide survey of Tennessee consumers by MTSU's Office of Consumer Research indicates the uptick in optimism continues this holiday shopping season. The Tennessee Consumer Outlook Index rose to 185 in December, up from 157 in September and 123 in June. 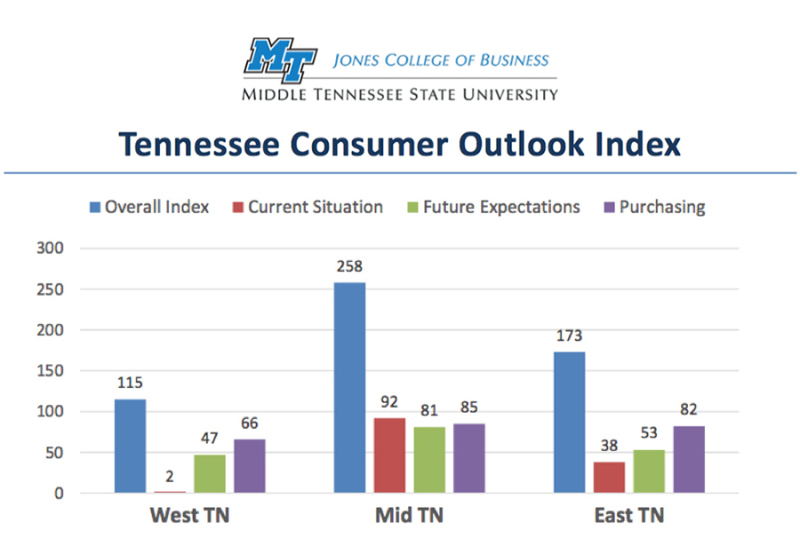 "Although expectations for the future of the economy have moderated slightly, more positive perceptions of the current economy and increasing beliefs that now is a good time to make large purchases have lifted consumers' outlook," noted Tim Graeff, director of the Office of Consumer Research in MTSU's Jones College of Business. "Improving consumer outlook comes at a good time, as many businesses and retailers rely on strong holiday sales to make up for any downturns in sales during previous times of the year." The current survey of 630 Tennessee consumers was conducted Dec. 1-7 with a margin of error of 4 percentage points. The quarterly survey consists of a series of questions that measure areas such as how consumers feel about the local, state and national economies as well as their personal financial situations and the job market. • For holiday spending, the majority (71 percent) of Tennesseans expect to spend either "more" (22 percent) or "about the same" year (49 percent) as they spent last. Meanwhile, 26 percent expect to spend "less than they spent last year." • Tennessee consumers continue to feel better about the state's economy compared to the national economy. • Overall, perceptions of the job market remained relatively steady. In addition to tracking an overall index, the survey includes sub-indices that measure consumers' views on their current financial situations, future expectations and purchasing plans.